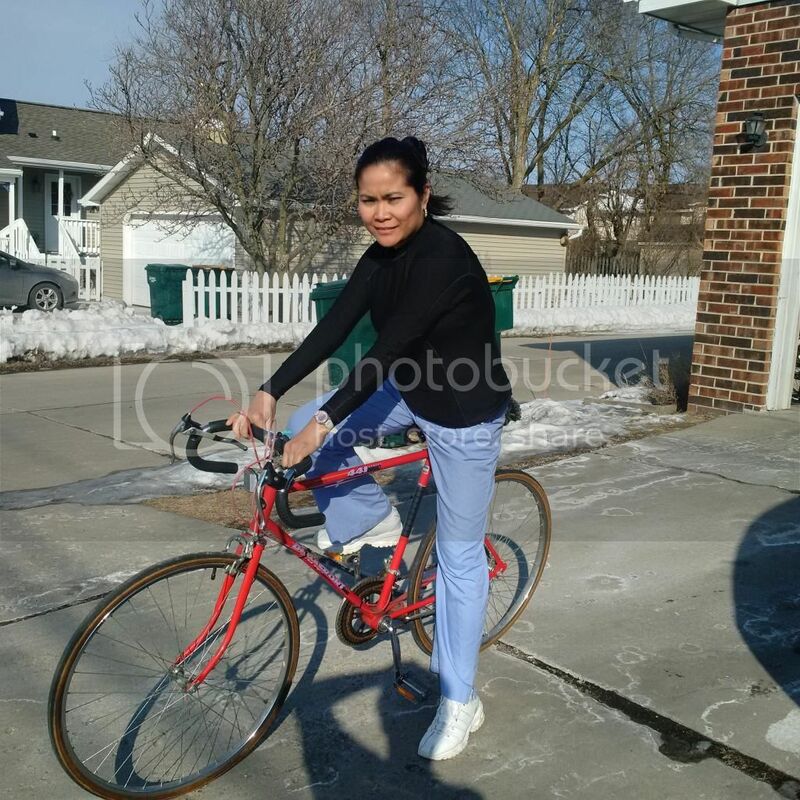 Still very cold here in Wisconsin but the sun is out and I feel like driving my bicycle. Ha ha just my wishful thinking though. I have seen people riding their bicycle even on winter season as long as the sun is out and it's not too cold. But, too bad I am not yet into that kind of outdoor activity. Wisconsin weather is too cold for a Filipina like me that grew up in a tropical country. No, I didn't go out biking but I am showing you what I'm going to wear this summer when the weather is beautiful and perfect for biking. I am wearing a Compression shirt for women by Goddess Rash Guards. I got it for a discounted price for product evaluation purposes. It's a perfect work-out outfit because it's lightweight and gentle on skin. I wear it during my indoor work outs and when I feel like wearing it. When I feel too cold, I wear it under another shirt. I even wore it to work under my blouse or sweater. They come in four colors( black, light blue, turquoise and white) I ordered black because I like black outfit for work outs. I love that It's made in USA, very flexible, made from nylon, spandex and with double flat lock stitching. Compression shirt is stretchable I can do stretching exercises with ease and comfort. It dries easily too, when I am sweating a lot I don't feel like soaking in wet shirt so I can continue on my work outs. I love the idea that it's a long sleeve, which make it a perfect outfit for outdoor activities. According to the manufacturer, the shirt feature a UPF 50+ that block out sun harmful rays and keep skin young and beautiful. I have tan and dry skin and I am careful not to get anymore sunburn otherwise my skin will look extremely dry. With Goddess Rash Guards Compression Shirt I can focus more on my what I'm doing rather than what I am wearing. I know I will look good and feel comfy with this shirt so I don't have to worry about outfit malfunction while doing my activities. I think what I love the most is the 100% money back guarantee and the lifetime warranty. Who offers that kind of warranty? Not a lot of manufacturer does. I love this shirt and recommends it to any women. Want to get your own Compression shirt? Place your order on their Amazon link, copy and paste the link below. Disclosure : I received a discounted price of Compression Shirt For Women from Goddess Rash Guards for product evaluation purposes. However, all opinions were my own and not influenced in any way. I love that sis, looks great on you. I should get one for myself hehehe. Just dropping a line to say I miss you hehehe.